The first time I watched Audition (Tartian release) I was blown away, it was clear that Audition left me visually disturbed and mentally excited. Is this a good horror? Yes this is a genuinely scary film that make you feel nervous and also makes you laugh at the bazaar. Despite not categorising itself as a 'horror film' Takashi Miike's Audition, has a lot of 'horror' moments that will make you squirm. In 1999, when it was screened at various film festivals and released via Tartian Audition gained a reputation of being a film that witnessed walkouts by members of the audience and people who watched it via DVD stating that had to return the film due to its graphic nature... If this genuinely happened or a publicity-driven rumour is unknown at this point but after having seen Audition for the first time I'm not surprised they did. The plot is about revenge, love and what can happen if love has boundaries. Shigeharu Aoyama (Ryo Ishibashi), a widowed TV producer pretends to be Auditioning young women for a new show, when in fact he's really looking for a wife. He finds a young attractive and attentive woman though the casting but as the film progresses, he comes face to face with her suspicious past. Director Takashi Miike uses the atmosphere coupled with gore and realism to tell this story that views many scenes using dreams, the protagonists dreams. The casting is amazing. Asami (Eihi Shiina), the want-to-be actress is so engaging. Her submissive self, clean as it may seem, makes her cunning and the opposite of trustworthy. Her character provides the viewer with intrigue and calmness that when the story gets going on the 3rd half of the film you are almost shocked about the turn of events. The writing is on the money especially during the climax, where it focuses on Asami’s lines for chills rather than simply gory visuals. Miike proves that psychologically traumatised characters are far more effective at sending a chill down your spine, rather than loud off the cuff scares. Instead, the story breaks new ground by making the viewer think, could that be me? Could that really happen? What did really happen? Instead of what is happening and what the story has already unfolded. What Miike leaves the viewer to guess, is whether things would have turned out the way they do or is it only a dream. 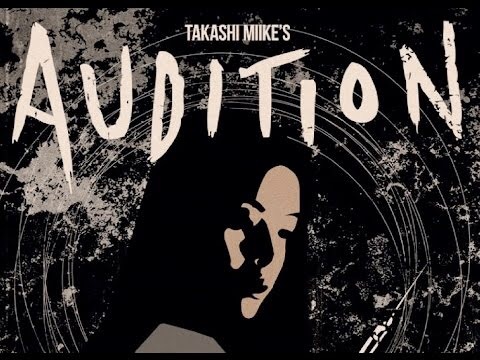 Audition Is Japanese horror cinema... A long-haired actress dressed in a white gown, a troubled history of characters and a score that makes the hairs on your back stand up in fright. This puts Hollywood to shame as it does terror so well and the story line... Well I don't really want to talk about the twist so go ahead, make the purchase and get the steal book while you can! Amazing transfer at 1080p , DTS HD (Bluray release) and an intro from the man himself Takashi Miike. This movie is one to watch!